Boracay is a bone-shaped island that is approximately seven kilometers long and one kilometer wide with a series of white, long beaches filled with palm trees. 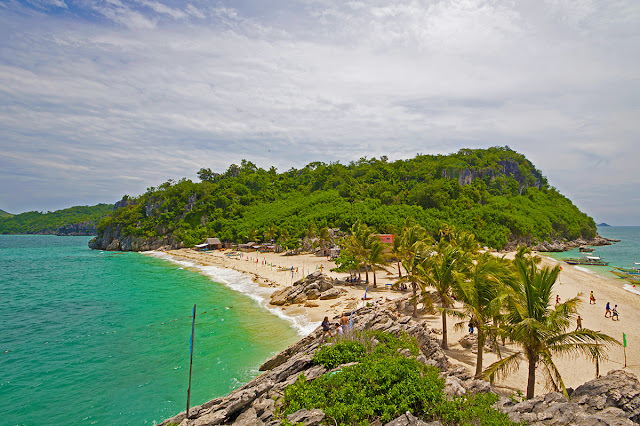 It is considered by many to be the "Beach Capital of the Philippines" and has been visited by many big names in the past. Because of the hundreds of people who flock the shores every year, top-class hotels and inns are set on claiming property and setting up as close to the shoreline as they can. One of the quality hotels you can find here is Villa Caemilla, a beachfront boutique hotel. As you step into the lobby, welcoming smiles from the staff and soft music from the restaurant will make you feel right at home. During meal times, savor some of their tasty dishes like the Royal Egg Benedict, Duck Breast, Mahi-Mahi and Foie Gras. From refined to ready-to-eat, there are definitely a variety of dishes you can choose from to suit your palate. Take a break in one of their cozy, spacious rooms that are decorated to look regally relaxing in white and accented by splashes of wood brown. Surrender your weariness on the huge and comfy beds and sleep away all your troubles. Part of the hotel’s personalized services is the pillow menu where guests can choose special types of pillows— from Hypoallergenic to Bamboo ones. This is perfect for guests who have certain preferences when it comes to their choice of bedtime cushioning. Do you like buying souvenirs? Items are available at the lobby, so guests don't have to walk far to D'Mall to buy them. Pick from practical choices like a shawl to protect you during sunny walks or postcards that you can send to your friends back home. Walk across the soft sands or lay back on a lounge chair to enjoy the breathtaking sunset that will surely complete your day. If you’re looking for a quiet beachfront hotel, with great food and exceptional service, look no further than Villa Caemilla. Discover even more amazing things about Boracay's Boutique Hotel with more blog articles. For more fun travel videos and clips, head over to our very own YouTube channel.